Jim Riggs: FIRST TIME OUT! 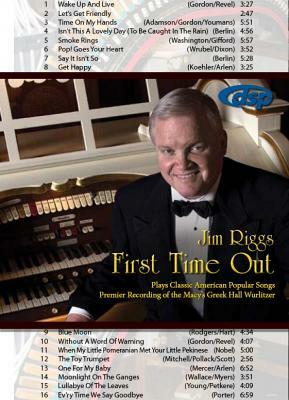 Jim Riggs performs favorites from the American Popular Songbook in a state-of-the art CD recording, playable on all CD players, filled with more than 74 minutes of exciting music! Here our exciting Greek Hall Wurlitzer, which was once part of the Smithsonian Institution collection because of its pristine, untouched pipework and sound.